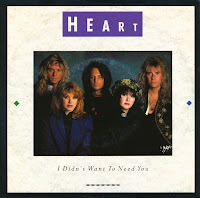 'I didn't want to need you' was written and composed by songwriter Diane Warren and recorded by Heart on their 1990 album 'Brigade'. The track was released as the second single from the album. The single reached number 23 in the US Billboard Hot 100 chart and reached number 47 in the UK singles chart. In Europe, the single went by without anyone noticing. 'Will you be there (in the morning)' was written by songwriter and producer Robert John 'Mutt' Lange, who also wrote Heart's 1990 chart hit 'All I wanna do is make love to you'. Personally, I much prefer this song. The track was released as the first single from the band's 11th studio album 'Desire walks on'. It was the only single from the album to reach the chart, peaking at number 39 in the US Billboard Hot 100 chart. In the UK, it reached number 19. The 7" single was released only as a picture disc in the UK. 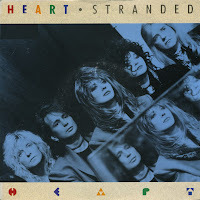 'Stranded' was released as the third single from Heart's tenth studio album 'Brigade'. The song was written by J. Harrington and Jamie Kylie and produced by Richie Zito. It features Nancy Wilson on lead vocals. The track peaked at number 13 on the US Billboard Hot 100 in the autumn of 1990, but stalled at number 60 in the UK singles chart. The B-side is a highly melodic piece of work that could be considered a blueprint for many Heart tracks from around that time. Taken from their Heart's tenth album 'Brigade' (1990), 'All I wanna do is make love to you' was the first single from the album, composed by producer Robert John 'Mutt' Lange. In the track, the protagonist speaks of a one-night stand with a man, only to reveal later in the song that her intent all along was to use the encounter as a way to become pregnant, because the man she really loves is not able to give her children. It was not the best lyric Heart ever performed. 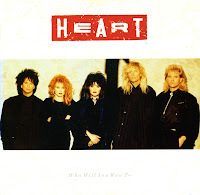 In the liner notes of Heart's album 'The road home', Ann Wilson commented on the band's dislike for the song, stating, 'Actually we had sworn off it because it kind of stood for everything we wanted to get away from. It was a song by 'Mutt' Lange, whom we liked, and it was originally written for Don Henley, but there was a lot of pressure on us to do the song at the time.' The single was a hit for the band, peaking at number 5 in the Dutch Top 40, number 8 in the UK singles chart and number 2 in the US Billboard Hot 100. 'Who will you run to' was the second single from Heart's 1987 album 'Bad animals'. The song was written by Diane Warren. The lyric contains a clear warning to a departing lover that there will be no one else who could care for and support him in the way that the singer of the song has. The single reached number 7 in the US Billboard Hot 100 chart and number 30 in the UK singles chart. The B-side is the most beautiful track from Heart's 1985 self-titled album. 'Alone' was composed by Billy Steinberg and Tom Kelly. It was first recorded in 1983 by Steinberg and Kelly's pet project, I-Ten, on the album 'Taking a cold look'. 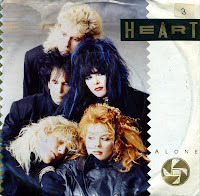 Heart recorded it in 1987 on their album 'Bad animals'. It was released as the first single from that album. It became their biggest hit, spending three weeks at number 1 on the US Billboard Hot 100 chart and reaching number 3 in the UK singles chart. In 2007, disaster struck. Canadian shrieking witch Celine Dion recorded a cover version of this great song, shattering eardrums wherever her version was played. Her cold, metallic voice cut right through any sense of beauty. Thankfully, we still have Heart's version. My photographic memory does not really help when a song is released in two different sleeves. But in this case, I ended up buying two different singles from two different countries with two different B-sides. The European edition (pictured above) features 'All eyes', whereas the UK edition (pictured below) features 'Shell shock'. 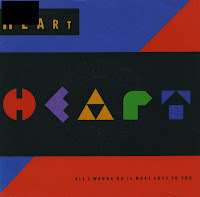 Both tracks are taken, like the A-side, from Heart's 1985 self-titled album. 'These dreams' was dedicated (on the album) to Nancy Wilson's good friend Sharon Hess, who died of leukemia shortly before the song was made. The lyrics of the song describe the fantasy world a person enters when faced with a difficult situation in real life. The final verse seemingly suggests that, moments before awakening, what one desires the most is exactly that which is out of reach in a dream: 'In a wood full of princes, freedom is a kiss / But the prince hides his face from dreams in the mist'. The song was written by Martin Page and Bernie Taupin. It was first offered to Stevie Nicks, but she had no interest in recording the track. Heart were more impressed, and decided to record it. When it came time for Nancy Wilson to record her vocal, she was suffering from a cold and her voice sounded somewhat raspy and gravelly. After the song reached its peak of success, producers reportedly wanted Nancy to recreate the gravelly sound on future recordings, asking her, 'Can't you just get sick again?'. Both 'Never' and 'These dreams' were released as singles in 1985, but this double A-side was released in the UK in a limited edition gatefold sleeve edition in 1988. This is after their biggest success 'Alone', taken from 'Bad animals' (1987). 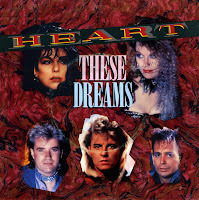 These two tracks come from Heart's previous self-titled album (1985). This double A-side release was another success for the band, peaking at number 8 in the UK singles chart. 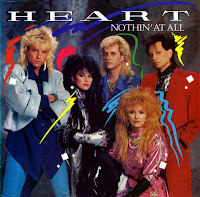 'Nothin' at all' was the fourth single taken from Heart's self-titled 1985 album. It is a love song which describes a new relationship which falls into place without effort or conflict. The track was remixed for this single. In the remix, a vibrant alternate lead vocal take from Ann Wilson is featured with striking embellishments; Howard Leese's guitar solo is vastly different. The single hit number 10 on the Billboard Hot 100. It only managed to reach number 76 on the UK singles chart, but a reissue in 1988 managed to reach number 38. 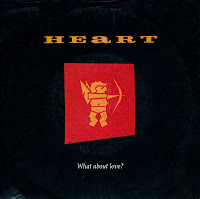 The B-side of this single is a rather curious choice: the track was taken from Heart's 1978 album 'Magazine'. 'What about love' was originally released in 1985, but in the UK the song did not chart. After the success of their 1987 album 'Bad animal' and its single 'Alone', the track was re-released in 1988. 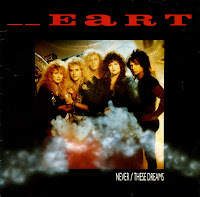 At the time of recording, the song's sound marked a considerable change in the musical direction for Heart, moving from the hard rock and folk rock of their earlier work to a more polished, power-ballad sound. On its re-release, the single peaked at number 14 in the UK singles chart. After the sales of their third album 'Magazine' were disappointing, Heart bounced back with their fourth one, 'Dog & Butterfly'. The album reached number 17 on the US albums chart. 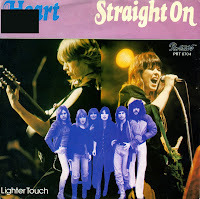 'Straight on' was released as the first single from the album. However unsuccessful in Europe, the single peaked at number 15 on the US Billboard Hot 100. 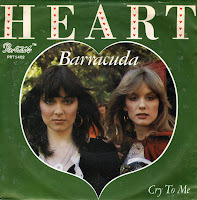 'Barracuda' was released in 1977 as the first single from Heart's third album 'Little queen'. The song is an aggressive hard rock number notable for its galloping guitar riff. In interviews, Ann Wilson commented that the song was about the band's anger towards Mushroom Records, after they attempted a publicity stunt involving sisters Ann and Nancy and a made-up lesbian affair. The song particularly focuses on Ann's rage towards a man who came up to her after a concert asking how her 'lover' was. She initially thought he was talking about her then-boyfriend, band manager Michael Fisher. After he revealed he was talking about her sister Nancy Wilson, Ann became angry and went back to her hotel room to write the original lyrics of the song. The single reached number 11 in the US Billboard Hot 100 singles chart, but wasn't such a success in Europe. 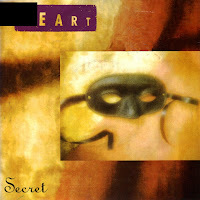 'Secret' was released as the fourth and final single from Heart's tenth studio album 'Brigade'. The single at number 64 on the US Billboard Hot 100 and number 79 on the UK singles chart. When I found this single, I did not know it had been released. I did know the track, because my sister owns the album 'Brigade'. I always thought it was one of the best tracks on the album so I was very happy to get this single. 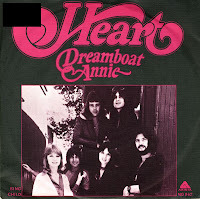 'Dreamboat Annie' was the title track and a recurring theme on Heart's debut album. Originally divided in three parts scattered on the album, the single version was a mixture of all three and did not appear on the album in this form. The B-side 'Sing child' was taken from the album and foreshadowed the later singles of the band. They would be stuck in a middle of the road rock phase for a couple of years. Heart released their debut single in 1976. 'Crazy on you' would be featured on their debut album 'Dreamboat Annie'. It was a hardrock track, true to the sound of the early years of the band. The single peaked at number 35 in their native America, but reached number 2 in the Netherlands. I vividly remember hearing this song as a child, thanks to my sister who'd bought the single while they were too expensive for me to buy. I've always held a soft spot for the band since then. 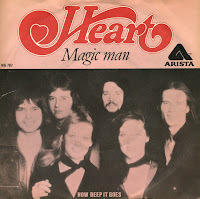 'Magic man' was released as the second single from Heart's debut album 'Dreamboat Annie' (1976). With lengthy guitar solos, the song featured notable Minimoog synthesizer usage. Written by Ann and Nancy Wilson, the song is sung from the viewpoint of a young girl who is being seduced by an older man (referred to as a Magic Man), much to the chagrin of her mother, who begs the girl to come home. In interview, Ann Wilson revealed the 'Magic Man' was her then-boyfriend, band manager Michael Fisher, and part of the song was an autobiographical tale of the beginnings of their relationship. 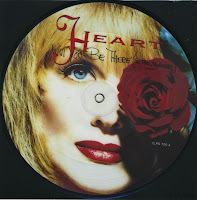 The single became Heart's first Top 10 hit in the United States, peaking at No. 9 on the Billboard Hot 100. In the Netherlands, the single peaked at number 7, while it didn't chart in the UK. Heart released a live album called 'Rock the house' in 1991. The album marked a sharp decline in sales after a period of success that began in 1985 with the release of the self-titled 'Heart'. 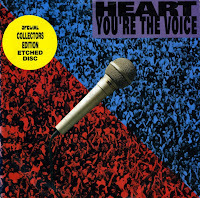 The single 'You're the voice' was taken from this album, a cover of the song by John Farnham. I bought the single not because I thought this was a particularly good version (live tracks are usually unlistenable) but because of the limited edition etched disc. This disc featured the lyric of the song on one side, and the A- and B-side track on the other side. These kind of special editions are always so nice to have. 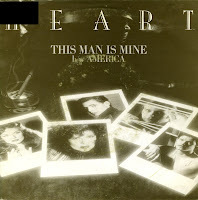 'This man is mine' was the first single to be released from Heart's sixth studio album, 'Private audition' (1982). The song is an ode to The Supremes. The single peaked at number 33 in the US Billboard Hot 100, but didn't chart in the UK and the Netherlands. 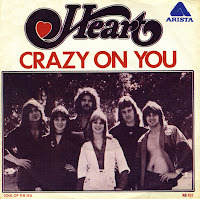 I knew Heart mostly for their earlier singles 'Magic man' and 'Crazy on you', so this song was very different from that material. I liked it instantly, though, and when I got a little older I was very happy to be able to buy this single.